The track opening meeting was on 30th Sep 1989 although it was open for training a few months previously and was the first synthetic track to be built in Norfolk. It was developed as a joint initiative between Norwich City Council and the University of East Anglia (UEA) on whose campus the track is situated. 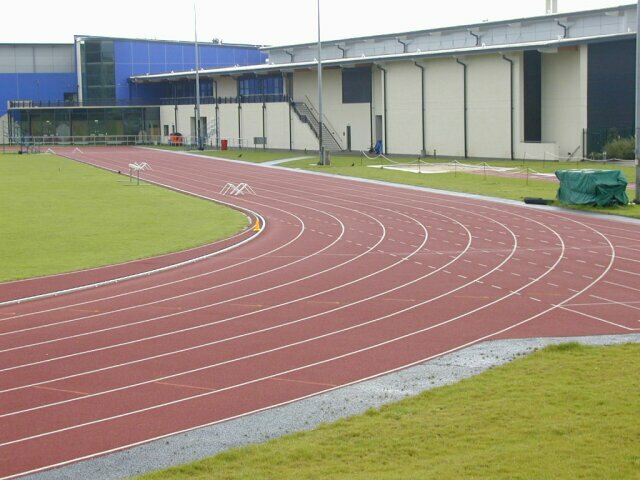 The track is now part of the £17.6 million Sportspark which opened in September 2000 and was officially opened by HRH The Princess Royal on 6th Feb 2001. The first turf for it was cut by Sir Roger Bannister on 2nd July 1997. The Sportspark was built over the original pavilion and as a result the track was partially rebuilt as all the runways were moved from their original location outside the first bend and the track was resurfaced with Polytan WS. Part of the original runways and the pit can still be seen. There is a picture of the original track on the University of East Anglia website. The Sportspark has its own website and amongst numerous facilities contains a Human Performance Centre.